130 years ago today, on July 7th 1887, Marc Chagall was born in the small city of Vitebsk, Belorussia. Since we know Chagall loved birthdays – he painted his own, after all – we wanted to celebrate the occasion by taking a look back at the prolific career of the painter now considered to be one of the pioneers of Modern art and one of the last great European Masters. Born to a devout Jewish family in the Russian Empire in the late 1800s, Chagall’s upbringing was a vibrant blend of Russian folk art and Hasidic tradition that would go on to have a huge influence on his later work. First training as a signmaker then studying painting in St Petersburg in the early 1900s, Chagall eventually moved to Paris where – surrounded by Cubist and Expressionist luminaries, such as Chaim Soutine, Robert Delaunay, Fernand Léger and Albert Gleizes, and the Fauvist, Impressionist and post-Impressionist works he saw in Parisian galleries – he began to develop his now famous playful, colourful and fantastical style. Chagall’s marriage to his muse Bella Rosenfeld yielded happy years of paintings influenced by love and family before the Russian Revolution, WWI and WWII triggered a more turbulent time in his life, whereby he travelled Europe with his family before eventually moving to the USA in 1941 when the threat to European Jews made life in France too dangerous. Eventually moving back to Paris, Chagall lived out the rest of his years as one of Europe’s most prolific artists, turning out celebrated works in a variety of different media from print to sculpture. 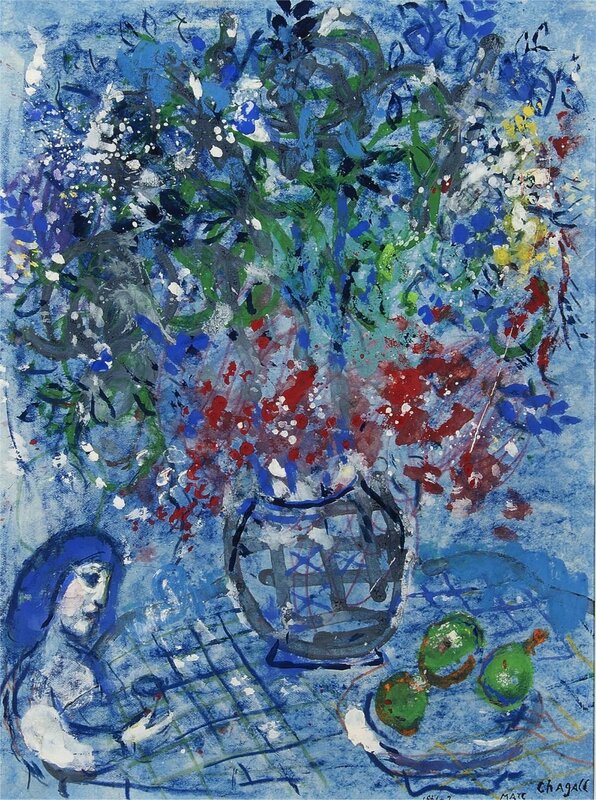 While he is often lauded as one of the proponents of Surrealism, Chagall himself dismissed this moniker and indeed all labels, stating, “The great painters have always been above movements.” Thus, his enduring legacy to this day is his truly unique and singular style; the art – like the man – joyful, enigmatic and undefinable. Here at Trinity House, we’re honoured to be responsible for the sale of an original Chagall piece, Le Couple au Traîneau (1965). An example of his later work, Le Couple is a fluid and abstract piece with typically bold colours and the subject of a lovers’ embrace. Complete with his usual folk-influenced representations of animals and abstract human figures, Le Couple demonstrates many of the characteristics that distinguish Chagall’s oeuvre and would make a fantastic addition or start to any fan’s collection. Chagall didn’t only work with paintings; over his long and expansive career the artist became famed for his opera and ballet set designs, printmaking, stained glass, sculptures, mosaics, ceramics and tapestries. Chagall was the first living artist to be exhibited at the Louvre. Having lived through not only the Russian Revolution but also both World Wars, war had a large impact on Chagall’s career – not least the treatment of European Jews at the hands of Hitler and the Nazi party. Chagall also described himself as being in love with love, with romantic and poetic associations often represented in his work. Chagall had a fairly tumultuous relationship with Picasso with both artists criticising and lauding each other’s work alternately. In 1977, Chagall was awarded the Grand Medal of the Legion of Honour – France’s highest accolade. Chagall died in France on March 28th 1985 at the grand age of ninety-seven. He died while working on a lithograph of himself in the studio. If you’re a Chagall fan and would like to know more about his work, you can browse our collection here; and please get in touch with our expert art advisers if there’s anything else we can help you with.